Today, we're talking marketing using keyword research as a key component of SEO for F&B/hospitality businesses in Scotland - but really, the principles of this process are applicable to any business in any market. Keyword research is one of the key ways that you can figure out what your customers are searching for, and at what volume - and how your competitors are doing in terms of turning up on those crucial search engine results pages. Note: this is probably a good second chapter after you've read our blog on SEO for Restaurants. Okay - let's do it then! What is keyword research and how can you use it to improve your website ranking? Keyword research is an incredibly important practice in today’s digital age. It allows you to define words and phrases to target for bespoke content, paid advertising and SEO purposes. Targeting the right keywords to use can be a tricky task, but through sound research you’ll be able to better define the terms to target, which will maximise your marketing efforts. In this blog, we’ll cover everything you need to know about keyword research, from the fundamentals you need to know in advance, to the process itself and how that translates into optimising your SEO. Keywords, in terms of your website, are the defined ideas and topics related to each page’s content. For example, this page’s main keyword (or key phrase) is ‘What is keyword research’. In terms of search engine optimisation (SEO), keywords are the words and phrases searchers enter into their search engine - so if you’ve landed here from a Google search, for example, the words (or phrase) you typed into Google were keywords. Keywords are important to businesses now more than ever with a growing and ridiculously competitive online marketplace. Understanding the relationship between the terms people are searching and the content you offer on site is important for SEO as it allows you to create content relevant to your audience’s search terms. The knock on effect of this means your products and/or services can become easier to find in organic searches. Similarly, keywords are important for paid advertising (like pay per click PPC) because they target specific words and phrases potential customers are searching in order to find relevant information or to find and buy products. Keyword research is a crucial SEO practice that involves finding popular words and phrases people enter into search engines. This gives marketers like us a better understanding of search volume for certain keywords and how difficult it will be to compete for these in organic search results. If you’re a restaurant in Glasgow, it would be tempting to target a general term like “Glasgow restaurant” (and take advantage of an average monthly search volume totalling over 27'000 in Scotland) but the chances of ranking for this is slim, and it could take years to climb to that first page (or, more likely, you never will at all). So a crucial part of keyword research is defining terms that you’ll have a better chance of ranking for - targeting lower volume, higher relevance keywords that will provide better results. Walnut Wasp use Mangools KWFinder, a great little keyword research tool which allows us to find relevant keywords for our clients (they’ll also provide keyword suggestions which is handy!). 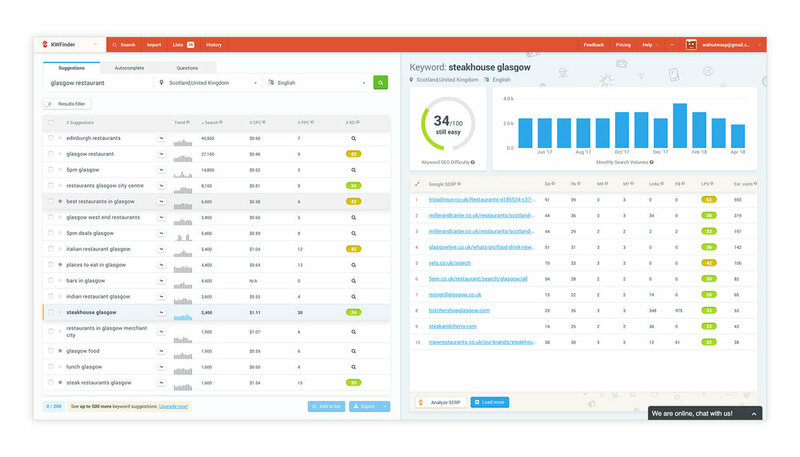 For us, Mangools is great because we can define a search location, and working with a lot of businesses here in Scotland, who possibly identify Scotland, Glasgow, Edinburgh etc as their target market. Using this tool, we can set the search results to target these locations, providing incredibly tailored search results. The KWFinder tool also returns information on an average monthly search volume, the average cost per click in Google AdWords, level of competition in PPC and keyword SEO difficulty, for various search terms. Let's do a walkthrough on how this info can help us to start to extrapolate different pieces of useful information. Firstly, we see that there's 27k monthly searches on average for this search term, as noted above. That's pretty massive. We also see that the type of content that Google favours for this type of search result, is usually aggregated editorial content - in other words, websites that are doing a really good job of collating various reviews, etc. Eight of the top ten results are basically lists of restaurants; only two individual restaurants have managed to creep into that top ten. So that tells us, among other things, that Google largely values editorial content rather than individual establishments for this keyword search phrase. It also gives us a good idea of which articles are highly valued by Google, which gives us a very good sense of where we'd like to have an inbound link coming from. So I can put those publications on my wishlist for backlinks. Now, in doing that, I've spotted that my second guess for a decent keyword for my restaurant, "steak restaurants Glasgow", has a healthy average monthly search volume of 1'600 searches. That's pretty encouraging. And, by clicking on that search result, I can see that there are far more individual restaurants landing on this results page. The tool has lots of useful data on how those sites are doing in terms of domain authority, and other ranking factors that Google uses to determine where your site lands on a search engine results page, but we'll leave that for now, as there's a more relevant piece of information to focus on. See - now that we're sorting the list by search volume, I've spotted that there's another relevant term that's actually more popular than "steak restaurants Glasgow" - and that's "steakhouse Glasgow". So, I'll click on that. Now we're talking. Loads of individual restaurants are showing up in this search, and they're ranked as having a relatively easy keyword difficulty score. This is the number (out of 100) that KWFinder attributes to each link to represent how secure their position on that search engine results page likely is. So if a site has 20/100, then it's going to be far easier to create a piece of content that has a chance of knocking it off the front page, than a page with a score of 65/100. That's a really quick look at how we can use KWFinder to come up with new keyword ideas, and also how we can identify competitors who are scoring well but who are also vulnerable. SEO: Keywords and how they impact website ranking. Keyword research is imperative to improving your organic search rankings (see our SEO blog for more on this). This, along with understanding the search habits of your audience, should be a key component of your content strategy. The language searchers use and the types of terms they are searching for can be taken and incorporated into your current on-page content, or utilised as ideas for new content such as blogs. As mentioned before, general search terms will normally have a much higher search volume, but these only account for around 30% of all search terms in any given day. The remaining 70% are for what are referred to as ‘long tailed’ keywords. Shorter search terms often indicate a research process, someone starting their journey towards a purchase, but who haven’t made their mind up as to what they’re really looking for yet. A search for “Glasgow restaurant” (average monthly Scottish search volume of over 27,000, remember) suggests that this searcher is considering going out for dinner, but it doesn’t tell us much else - what kind of restaurant do they fancy? Are they looking for bargains or a luxury experience? Long tailed keywords on the other hand are much more specific. For example, a person looking for a well-regarded steak restaurant in Glasgow might search “best steakhouse in Glasgow” (which has an average monthly Scottish search volume of 260) - and despite the lower search volume, we know this person knows exactly what they are looking for and are likely very close to the ‘purchase’ stage of their customer journey. Using these correctly will help you rank higher for these search terms, and in turn drive organic traffic to your website. The quality of this traffic will be much better, and searchers will likely be a lot closer to a purchase decision. That’s when the on-site content is important in order to sell your products and services to the customer there and then. Here's some awesome resources that we found on the subject of keyword research. Our blog on SEO for Scottish Restaurants is a helpful primer on the general subject, tailored specifically to F&B/hospitality in Scotland. Moz.com have a great primer on keyword research, and Moz.com generally is a great resource for all things SEO. Miles Beckler is an awesome YouTuber who does loads of great videos on digital marketing. This one on keyword research is a great place to start. The Google AdWords keyword planner, especially useful when combining with PPC advertising strategy. We actually do a really affordable keyword research report for clients, in the F&B/hospitality space and beyond, starting from just £200. It's a useful document that outlines the key information you need to widen your understanding of keywords your prospective customers are using, and the type of content that's generally being served to those searches. If that's something you're interested in, just get in touch!